If you’re anything like most homeowners, you’re always on the lookout to save on home repairs, remodels, and touch-ups. All those little savings add up. Paint your own living room, install your own hardwood, and unclog your own toilet—if you save on the little things, you’ll have money stowed away to hire professionals during the real rainy days of homeownership. While many aspects of roof repair and replacement require a certified Portland roofing specialist, one repair that you might be able to take care of yourself is fixing minor roof leaks. This do-it-yourself guide will go over the basics of identifying and patching your leaky roof. While it might sound counterintuitive, the hardest part of fixing a leak is usually finding the actual source of it. The leak could be a symptom of any number of issues: damaged roofing, missing shingles, or misaligned flashing around vent pipes and chimneys, among others. Try the following procedures for hunting down the source of your leak. Inspect the Attic. If you are lucky enough to have access to an attic, diagnosing the leak should be a little easier. Inspect the portion of the attic directly above the ceiling where you spot water stains or see a visible leak. Using a flashlight, inspect the rafters for water stains, drips, or mold. It may be helpful to have someone else spray your roof with a hose to help recreate the leak. They should start at the lowest portion of the roof and work their way higher so as to best isolate the source of the leak. Be patient. 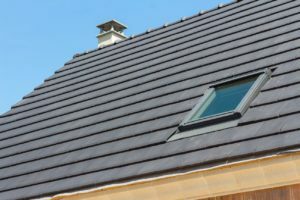 The roof often needs a good soak to get the leak going, and inspecting the entire roof in this manner may take an hour or more. If you don’t have an attic, or if you are unable to find the leak from within, you should use a properly steadied ladder to climb on and inspect the roof. Never do roof work during or shortly after a rain (wait for everything to dry). If your roof is particularly steep, you should probably play it safe and call a professional. Once you’ve ascended to the roof, look for shingles that are missing or visibly damaged. The most common places for leaks to form are transitions, places where the roof meets other parts of the house. Take care to examine the chimney, plumbing vents, and flashing where the roof meets a wall or other surface. If you find damaged shingles, you can replace them without much trouble. Use a pry bar to gently loosen (don’t tear) the tabs of the broken shingle and the two shingles above it. Next, use the flat end of the bar to locate and remove the eight nails securing the broken shingle. Remove the shingle, slide in a replacement, and secure it with new nails. If you discover that the source of the leak is coming from corners near walls and windows, inspect for damaged caulk. You may just need to recaulk the area, but if the siding or flashing is warped, damaged, or missing, you’ll need to replace that as well. If it’s a caulking issue, be sure to completely remove all of the old, damaged caulk before adding more. If the leak is caused by cracks in a roof vent, you’ll need to replace the entire vent with a new one. Unfortunately, just trying to caulk up the cracks will only delay the problem. If you’re in over your head, give us a call. We’ve been roofing Portland for over 20 years. Do I Really Need to Fix My Leaky Roof? Not only is it imperative that you get your roof leaks patched, but you need to do it sooner rather than later. Portland receives an average of 44 inches of rain per year—plenty enough to do a ton of damage. Too many homeowners settle for lining their house with buckets whenever it rains or just ignoring the leaks because they don’t seem like much of an inconvenience. Before they know it, they’ve put off leak repair for two or three years by constantly telling themselves “I’ll get to it later”. Little do they know how much the value of their house has decreased in that time. Their ceiling is warped, their insulation is demolished, their framing is rotting away, and mold has grown all over the place. What could have been a quick and cheap fix has turned into thousands of dollars in repairs that most homeowners insurance won’t cover because it was preventable. What’s the benefit of hiring a roofing contractor?